Assuming independence between failure modes makes system reliability calculation simple but it adds approximation error. Interestingly, error due to ignoring dependence can be negligible for a highly reliable system. This paper investigates the reasons and the factors affecting the error. Error in system probability of failure (PF) is small for high reliability when tail-dependence is not very strong or the ratio between individual PFs is large. We created various conditions using copulas and observed the effect of ignoring dependence. 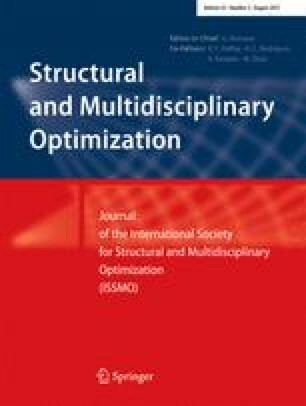 Two reliability-based design optimization problems with a 2-bar and a 10-bar trusses are presented to show the effect of error on the optimum design and the system PF calculation. For the 10-bar truss, there were 5 % error in system PF and mass penalty less than 0.1 % in the optimum design for a target system PF of 10−7 even though five truss failures were strongly correlated. This work was supported by the National Science Foundation, under the grant CMMI-0856431 by the U.S. Department of Energy, National Nuclear Security Administration, Advanced Simulation and Computing Program, as a Cooperative Agreement under the Predictive Science Academic Alliance Program, under Contract No. DE-NA0002378. Since copula is independent to marginal distributions, error only depends on copulas. For example, two joint PDFs defined with same copula and different marginal PDFs have the same errors for the same marginal PFs. In other words, the types of marginal distributions do not affect the error. Figure 19a and b show joint PDF contours of two failure modes. Figure 19a shows a joint PDF contour with different marginal distributions of limit state: the extreme distribution for G1 and the normal distribution for G2. Figure 19b shows a joint PDF contour with the same marginal distributions: the normal distribution for both G1 and G2. They have the same marginal PFs (P f1 = P f2 = 0.1265) and dependence model (the Gaussian copula with ρ = 0.7). The shaded region is the region of intersection PF. Although the two joint PDFs have different contour shapes, their errors are the same, 19.8 %, since their marginal PFs and copula models modeling dependence are the same.